I found 1 old thread but hoping someone has recent photos. I am redoing my kitchen. Doing a white cabinet and I picked Viatera Soprano as my quartz counterop. I know the small quartz samples you get can be very different from a big slab. 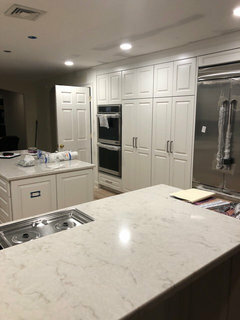 Does anyone have pictures of a LG Viatera Soprano countertop with white cabinets? 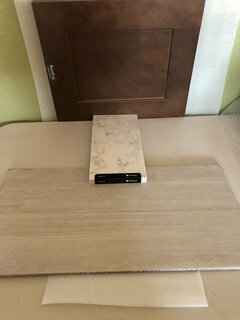 **I see Home Depot also sells a Viatera line but it's called LG Hausys Viatera, I am guessing this is a different composition and slabs may look different. 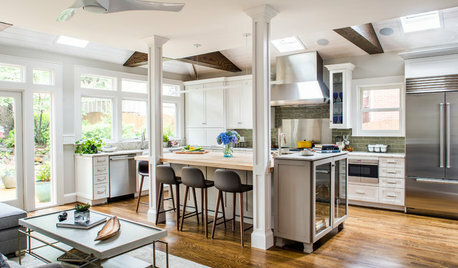 I picked a softer toned countertop bc my kitchen fully opens up to my family room which has dark wood built ins...so I thought doing a bright white or grey counter wouldn't flow with the adjacent rooms. If you did the LG Viatera Soprano (from the showroom not Home Depot) please send photos. Of course now I am getting nervous so any pics would help. Thanks! Actually ignore my comment about Home Depot. I actually think they are the same. I just happen to find my sample at a kitchen place. Wasn't sure how to edit my original post. Thanks! In my post here from last week seeking advice about pendant lighting, I include a photo of my LG Viatera Soprano sample. My cabinets aren't white, though; they are SW Colonnade Gray. I really like it with my cabinet color but am still wrestling with which back splash tile to use. Very hard to find a white subway tile that "speaks" to the creamy/off-white in the background of the Soprano. Jane C -- thanks so much for letting me know! 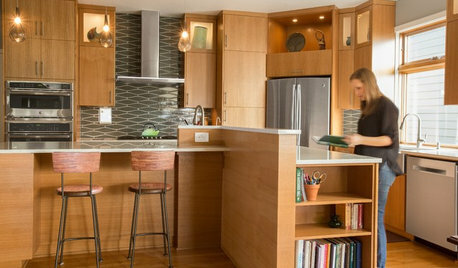 It's beautiful with your cabinets. It's amazing how different LG Soprano looks every time I see it in a different kitchen. 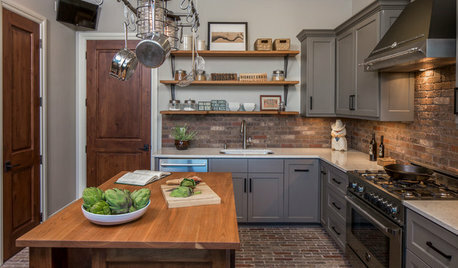 In your photos I see so much gray veining, but it is right next to your grey cabinets...on LG's website, it looks much more beige, but it's paired with dark wood cabinets. I guess I won't really know how it looks in my kitchen until it arrives. Since my cabinets are white, I will probably do some sort of color back splash...and I will try to pull a color from the veining in the actual Soprano...that's why I couldn't pick a head of time. Need to see how it looks once it arrives. On a different note I really like the lights you picked...and as many people said, lights are an easy change down the line if you get tired of them at some point. 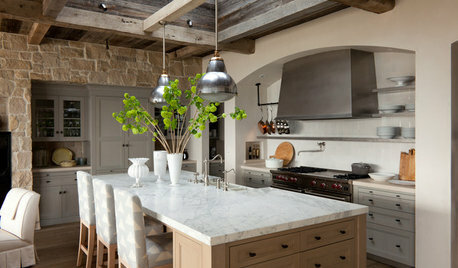 I will say keeping a light with all those glass panels clean will definitely be a challenge..especially in a kitchen. I am shopping for pendants right now and a few lighting people told me that. 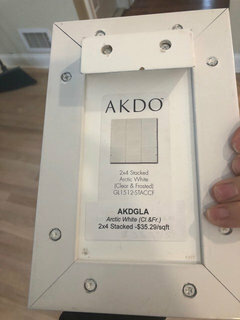 In addition, I have an all glass light in my master bedroom and it's high up so I don't get up there to dust it as much as I should and it bothers me bc it never looks 100 pct clean...and to he honest I am not sure it ever will unless I took the whole thing apart which I don't think I could do without the risk of damaging it...and then how long will it stay clean? Jane C. - Thank you for sharing your prior post and picture. The LG Soprano looks beautiful with your cabinets. Soprano looks SO different in every photo I have seen of it. In yours I see a lot of grey veining, but it is paired with a grey cabinet. On LG's website it looks much more beige but it's paired with brown cabinets. I guess I will have to see how it looks here in my home when it arrives. 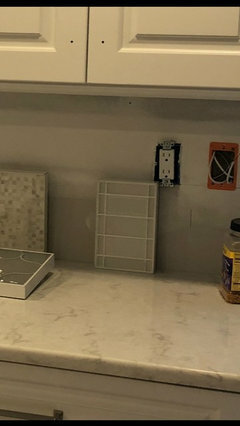 Since I am doing white cabinets, I probably do a color for my backsplash...I'll prob pull from the veining in the soprano and try to tie it back that way. Again, I have to see how it looks here and then pick one out. On a different note, the lights you picked are lovely and I agree you should pick what you like. Lights are easy to change down the line if you tire of them. BUT I will speak from experience --- lights with a lot of glass are SO hard to keep clean. I have a beautiful one in my master bedroom that I regret buying. It's mounted high (cathedral ceiling) so it's hard to get to and it never looks 100 pct clean and I spent a lot of money on it.. I feel like it will never look clean unless I take the whole thing apart....which just isn't feasible...especially bc how long before it looks dusty again? I guess it depends how vigilant you are about keeping the pendants clean and how much you love them. Thank you for the kind words and insights on the pendants (I sent them back)! I think with white cabinets you have a lot more leeway and agree --- you could probably pull one of the grays or taupe/gold tones in the Viatera Soprano for your back splash. Sandra D thanked Jane C.
Did you do your counters yet? I’m 99% there on the soprano quartz..
@Sandra D - yes thank you.. I’ve looked for a creamy counter if you can understand what I mean.. I’ve looked at photos and samples and find that the Soprano picks up the colors you use with it..
Catania & Sons Plumbing LLC - Yes Soprano definitely does "adapt" to what you pair with it. I also wanted a quartz that was a little creamy and softer in feel too. I also find it looks different in different lights and angles in my kitchen. For example, I picked a back splash and depending on what side of the room I put the sample in, it looks different. So many factors come into play - the sunlight, shadows, overhead lighting etc. It can make you a little crazy if you pay too close attention to be honest! I will take some pics during the day in decent light and get them to you soon. Hi Sandra D. and Catania & Sons Plumbing LLC -- I just put a deposit down on the Soprano and the fabricator estimates installation in about two weeks. I still don't have a backsplash though. 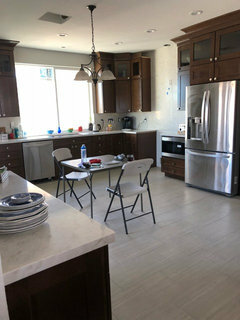 Some say I should wait to see how the whole picture looks with the cabinets and countertops installed, but I'd like to at least have some idea. (I'm even considering using the Soprano as a back splash, but that is a very pricey option.) I would be very grateful for any backsplash pictures you might share! Sandra D -- Thank you so much for these pics! 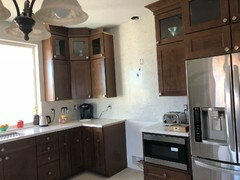 Not sure about how they would work with my gray cabinets but I really appreciate them. 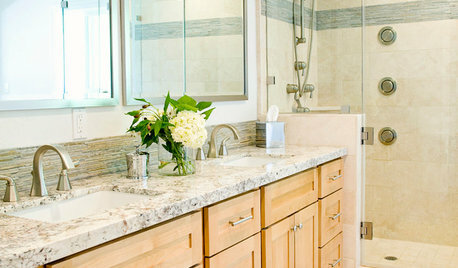 Do you know the brand name of the tile? Sandra D -- Many, many thanks for this. I think they'll look beautiful with the Soprano and your cabinets! Probably not going to work for my warm gray cabinets (sigh). But sometimes knowing what you can't do helps you know what you can do and hopefully that will be the case for my kitchen! Sorry for the delay. Today was a dreary cloudy miserable day. Will take pics of the Soprano counters tmrw and post ASAP! 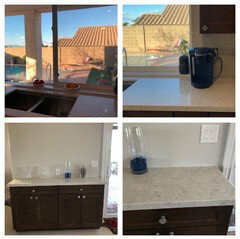 @sandra d - thank you - it really is nice.. looks awesome.. love the kitchen.. is that a counter depth fridge? brand? I need to pick one as well.. we are still in rough plumbing stage and getting cement pourback on the holes in floors that we made to move drains and framing for relocated rooms done by saturday..
fifamom - thanks! I will take more counter pics. I find every pic of Soprano I take looks different. The fridge is a built in, not counter depth. Brand is Jenn-Air. I had a Sub Zero in my old kitchen (it was here when I moved in). I was not a fan. People love them, not me - and they are so expensive. A built in one (same size as my new one) would have cost me 10k. confused? is it built in Jenn-Air? as i looked at some jennair built in and they were 10K.. I am looking at counter depth or even built in but depends on price..
fifamom - yes it is definitely a built in Jenn Air. Cost was about $7500. Jennair was also offering a rebate if you bought multiple appliances, so it ended up actually being cheaper than $7500, as the rebate was taken off the total bill. The sub zero built in was $10000. 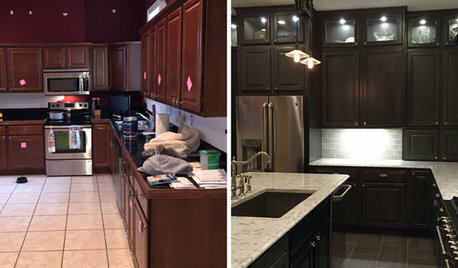 Sandra D. -- Thank you for sharing the pic, The counters are beautiful with your cabinets! LG Viatera Soprano counters & backsplash just installed in my kitchen..
@Jane C. - thank you!! 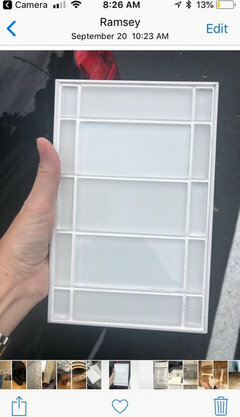 I looked through so many posts when I chose the Soprano Quartz and fell in love with it.. i used it on the backsplash as well including 1 slab behind the stove / hood and have had a 36 x 60 table top made out of it and am waiting on the base.. 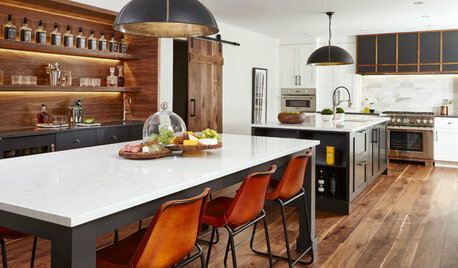 I wanted the kitchen counters and backsplash to be the same so they do not compete if you know what I mean..
HOUZZ QUIZHouzz Quiz: What Kitchen Countertop Is Right For You? 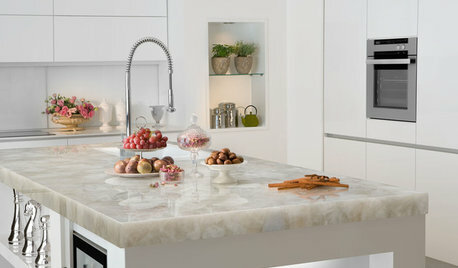 KITCHEN DESIGNWhat’s the Difference Between Quartzite and Quartz Countertops? Has anyone used lg hausy minuet quartz? Need help choosing counters: antique black granit or Carrera Quartz? 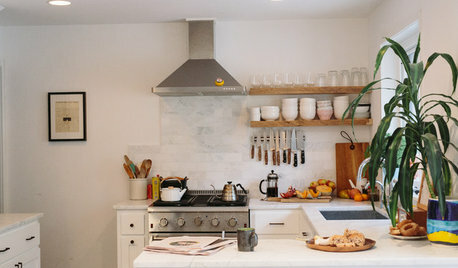 Any recs for a warm, subtle quartz similar to Caesarstone London Grey?